The RMIT Gallery has regularly changing exhibitions of Australian and international design including architecture, fashion, fine art, craft and technology. 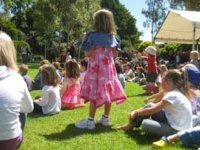 As well as the exhibitions, there are often talks, lectures, discussions and other public events. .........The last exhibition had an indepth look and discussions about street art. RMIT stands for the Royal Melbourne Institute of Technology although it’s now a University. 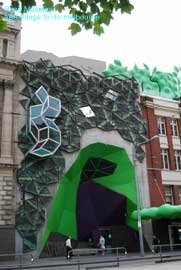 The RMIT Gallery also looks after the RMIT University’s permanent art collection which is housed in its buildings around the city. These are mainly Australian artworks of paintings, prints, drawings and sculptures including Indigenous works of art. .........It was built in 1877 by the Ancient Order of Hibernians and has been used as a meeting hall by the Suffragettes and as a commune during the General Strike of 1917. .........The green is apparently in reference to the Irish Catholic community which built the hall while the purple and white relates to the Suffragettes (Women’s Political Movement) who used the Hall from 1916. ...........You can get a free guided tour round part of it during the Melbourne Open House weekend which I highly recommend. 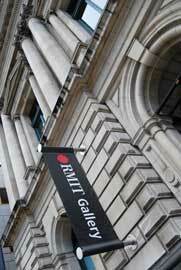 You'll find the RMIT Gallery at 344 Swanston Street, Melbourne, near the corner of Swanston and La Trobe Streets. It's open 11am - 5pm Mon-Fri and 12 noon - 5pm Saturdays, closed Sundays and public holidays. Access is available for the disabled.